Substantial completion in 2019 for the 924 is the Northwest Railway Museum's objective for this year's Giving Tuesday , an online global charitable giving event. Donations received by the Museum on Tuesday, November 27, 2018 will be designated for locomotive 924. 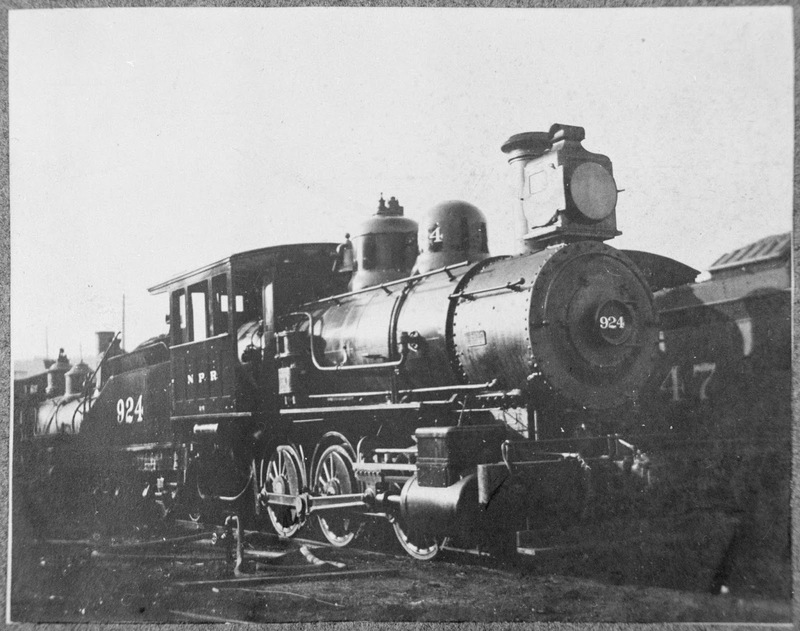 The Northern Pacific operated locomotive 924 in the Puget Sound basin from 1901 until 1925. It is a King County and City of Snoqualmie Landmark, and is notable for its connection with regional development and settlement. 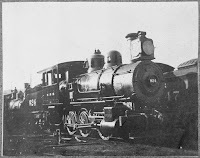 It was built by Rogers in 1899; the Northern Pacific assigned it to class L-5 in 1900. The 924 has been undergoing rehabilitation and restoration at the Northwest Railway Museum for several years. Prior work has included fabrication of a new tender tank, and firebox side sheet replacement. It also received a new steam dome and exhaust stack. Work has been continuing and progress has been significant. 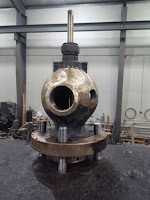 However, much of the work performed on a steam locomotive is nearly invisible to the casual observer, and not likely to make front page news in the preservation press. Notwithstanding, some important work is being completed. The steam turret is the manifold that distributes steam to appliances such as the air pump, water injectors, and lubricator. It features a large globe valve so that steam can be shut off, particularly if there is a broken pipe or fitting. This device must be serviced so it does not leak, and its mount must be carefully checked for problems in the seat or the mounting studs. All four of the mounting studs were found to be badly damaged so new studs were machined. Machinist Gerry P. and Ron W. took leading roles on this project, and it is coming together nicely. Over the last several months, additional stay bolt replacements have taken place. More than 100 stay bolts were removed as part of the side sheet replacement, and 48 of those important fasteners had not yet been replaced. Volunteers, staff and contractor Steven B. have together machined and installed these missing components, which are located above and behind the rear drivers. 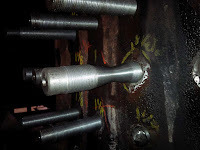 As the name suggests, they are bolts, but are threaded specially for a boiler with 12 threads to the inch and a "tell tale" hole drilled through the center. The "tell tale" is designed to show it is broken by leaking a trace of water or steam. Some holes in the side sheet were drilled to a larger diameter than originally designed, this requiring a larger stay bolt. This created a new issue because a larger bolt would be stronger and less flexible, which could lead to breakage. So a machinist tapered the larger bolt in the longitudinal center, allowing it to behave much like the smaller-diameter bolts. On another assignment, the team removed the boiler check valves for servicing. These devices allow water to be injected into the boiler without letting any pressurized steam or water escape. 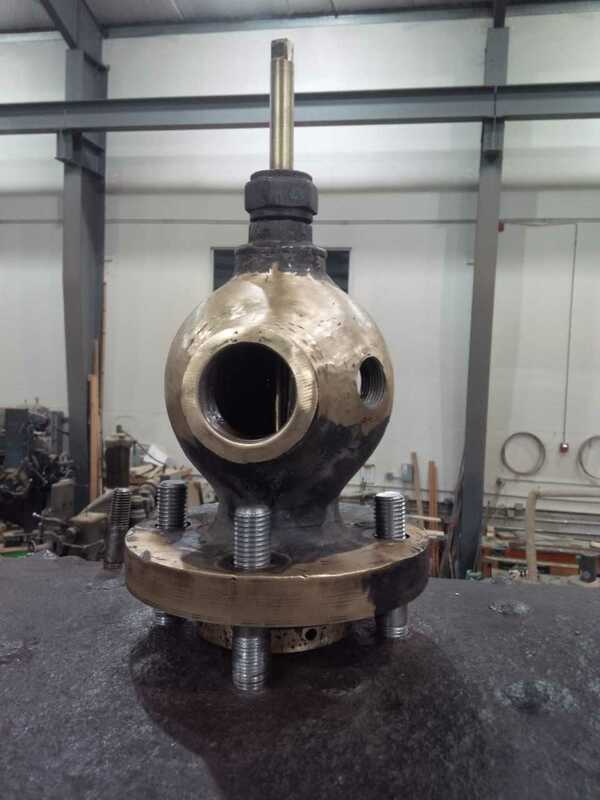 However, once disassembled, the old valves were found to have cracks in their castings that had been previously brazed, and internal wasting (material worn away) from years of use, and that appeared to be more than 50% of the original thickness. In addition, the studs that affixed the valves to the boiler were in poor condition. In short, the valves and mounting studs were not suitable for use on an operating boiler. 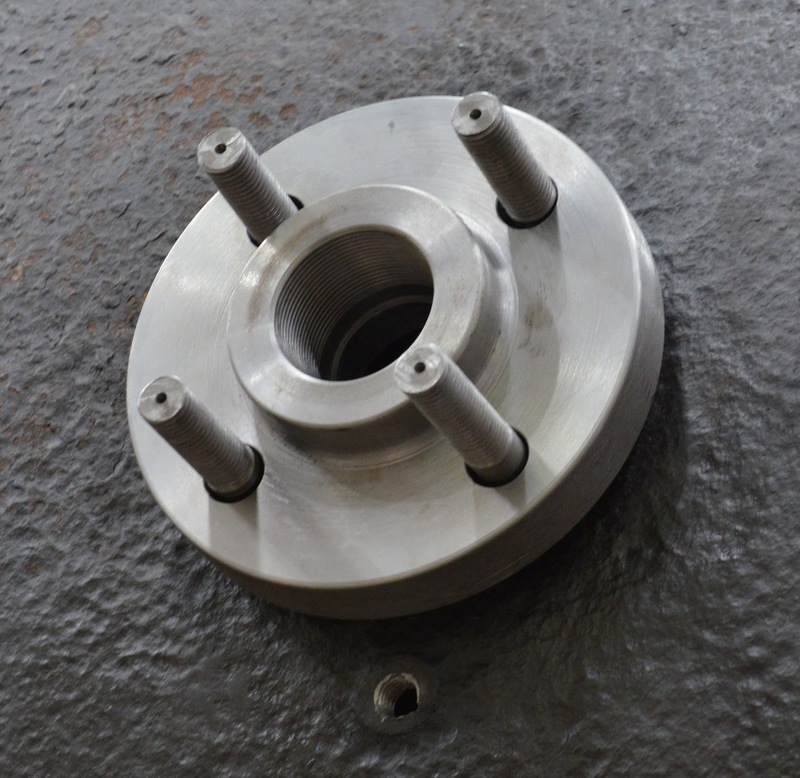 The team led by Lyle E. machined two flange plates that were then lapped into the boiler plate. Then the machinists produced new studs and installed them in the boiler, which in turn hold the new flange plates onto the boiler. Most railroad track is not completely level so spring rigging is critical to keeping the locomotive riding level, and providing proper weight distribution and equalizing so the locomotive does not derail. The 924's rigging was just plain worn out. The team took everything apart and in the end machined a variety of new components; repairs just weren't practical. It was a great opportunity to dust off the Museum's metal shaper and put it to work. Jay B. got some great experience with this old-school machine, which provided parts all ready for the milling machine to finish up. One of the more noticeable 924 assignments now under way in the Conservation and Restoration Center is fabrication of a new locomotive cab. Modeled on the cab constructed in Seattle after the 924 fell through a dock in Seattle, the cab restoration is constructed of white oak and eastern ash. The Museum's collection technician Gary James - who is a journeyman shipwright - has led this effort, with help from many skilled craftspeople. Engineer Mike D. designed the new cab and has created a detailed set of drawings documenting what the old and new look like. The Johnson Bar is a storied part of nearly every steam locomotive. It can best be equated to a gear shift, and controls the cutoff of steam to the cylinders. There was wear in the moving parts and linkages in the 924's Johnson Bar, and Ron W. took the lead in rehabilitating this iconic part. It has now been reinstalled on the locomotive. The 924 continues to progress, but remains one of the more costly restorations the Museum has undertaken. On Giving Tuesday please consider supporting 924, and help us achieve the goal of substantial completion in 2019. Order form here World's Bitcoin ATM Card that works to Withdraw funds from blockchain account to local cash through ATM with current market rate. The Card is super speed financial tool to experience easiness for crypto currency investors. One of the top website for organic SEO, where you can easily Drive More Traffic To Website within a month. Yes, it's time to increase your clients/visitors on your website and earn more and more money from your website or business. Visit for more details. The Museum is located in Snoqualmie, WA at 38625 SE King Street.